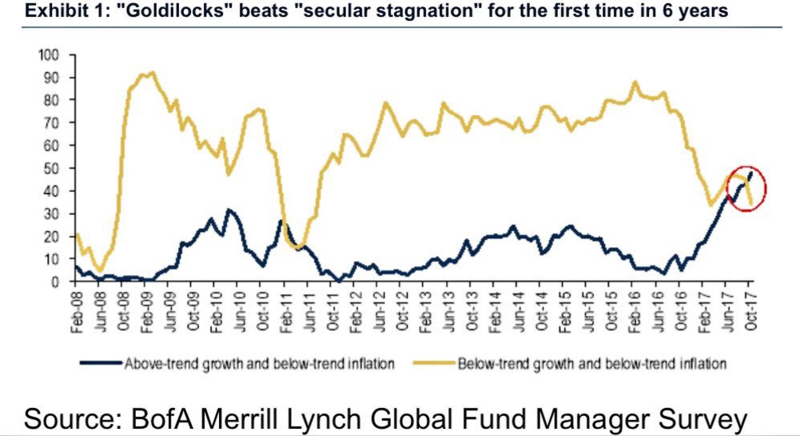 It’s official, Goldilocks is back on the stock market. At least according to the fund managers that participated in BofA Merrill Lynch’s Global Fund Manager Survey. For the first time in six years, a majority of global fund managers expects above-trend growth and below-trend inflation. Historically, this combination of growth and inflation proved to be just right for equity markets. But, is this really a Goldilocks economy? In case you forgot; ‘Goldilocks and the Three Bears’ is a fairy tale about a girl named Goldilocks, who uninvitedly enters the house of the three bears, where she finds a table set with three bowls of porridge. However, the porridge in the first bow is ‘much too hot’, while the porridge in the second bow is ‘much too cold’. Fortunately, the porridge in the third bowl is ‘just right!’. So Goldilocks ate it all up. While originally meant to teach children that your actions might hurt others, today the story of Goldilocks is frequently used to describe the most desirable economic circumstances for equity markets. And to come straight to my point, it looks like we’re not that far off. 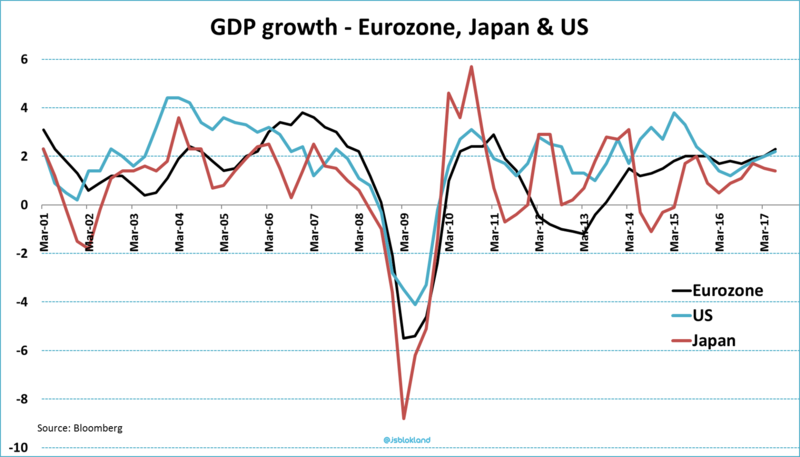 GDP is growing more than 2% annually both in the Eurozone and the United States. In addition, consumer and producer confidence is very robust, which implies healthy growth numbers going forward. Globally, the picture is pretty much the same. The IMF lifted the forecast for global GDP growth for this year and next by exactly 0.1% in its most recent World Economic Outlook. These marginal upward revisions signal two things: first, the global economy continues to improve, and second, there is no risk of overheating whatsoever. Overheating economies are characterized by high levels of capacity utilization, fast-rising commodity prices and mostly by significant increases in wage growth and inflation. Currently, none of these developments can be observed. In fact, even though deflationary risks have clearly subsided, inflation levels remain too low to the likings of central banks in many countries. Hence, these central banks are very reluctant to reduce their extremely accommodative monetary policy, activated during a period when deflationary risks were present. In some cases, like in Japan, the central bank continues to buy massive amounts of financial assets. The result: above-trend growth, somewhat low, but rising inflation levels and ongoing central bank liquidity. It doesn’t get more ‘just right’ than that. Obviously, a key question is if the Goldilocks scenario isn’t already priced in. Especially when you take into account that the Dow Jones index closed at an all-time high already 51 times this year. That is, without a doubt, very impressive, but at the same time doesn’t tell the whole story. 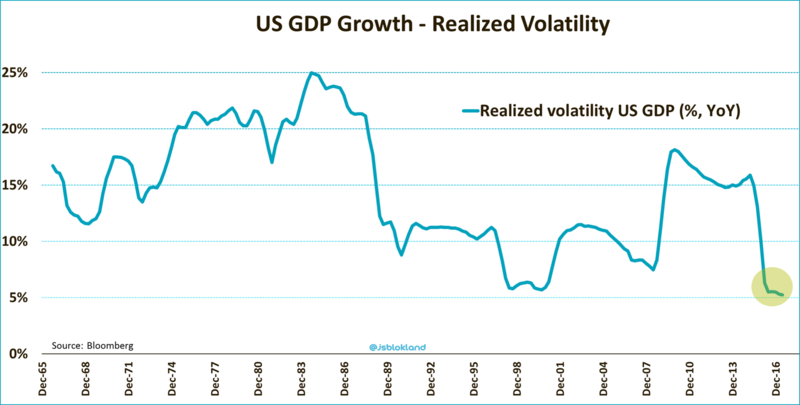 At least partly as a result of the historically low volatility in GDP growth, meaning growth is not only relatively high, but also extraordinary stable, stock market swings have become extremely small. Since the start of this year, the average daily movement of the Dow Jones index is just 0.3%, and 2017 could well turn out to be the most peaceful year for equities, ever. The historically low volatility in stock prices comes with the notion that 2017 is by no means exceptional in term of return. Surely, a year-to-date return of 16% is way above ‘average’, but in stocks markets the average doesn’t exist. 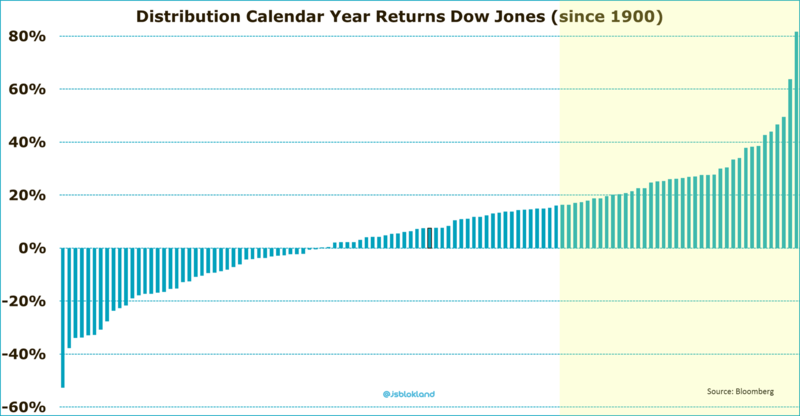 Since 1900, the Dow Jones index managed to realize a return north of 16% in no less than 37 years. Hence, in almost one-third of all calendar years since 1900. And this analysis is just for the US. Stocks have risen significantly less this year (10% and 11% respectively) in Europe and Japan. Also, all-time highs are not yet in sight, and require substantial gains from the current levels. Furthermore, valuation levels of European and Japanese stocks are far more attractive that those of US stocks. Add the fact that Europe and Japan tend to profit more from an increase in global GDP growth, given their open economies, and that central banks are still adding monetary stimulus and Goldilocks really comes to live. One reminder, however, even Goldilocks finished her bowl of porridge at some point.